Justin's WeatherTalk: Is the Trend Our Friend? Hope you had a good view of the snow burst yesterday. It wasn't the 2 inches at BWI I need to end my beard. Here is the radar from Tuesday mid day, and a pic of the coating I had at my place. 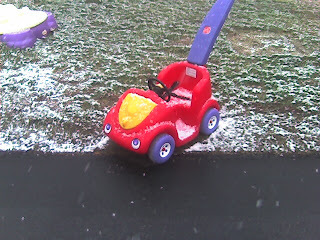 In honor of my son's 2nd birthday, he let me use his buggy to show the snow. It melted pretty quickly though. Skipping ahead to Thursday's storm, I have a hard time getting excited about this storm considering our track record since mid December. The guidance has us with a mix to rain , then perhaps some frozen junk at the end on Friday morning. Nothing pure, nothing clear cut. So this is when I rely on climatology. Hereford Zone and Carroll County with the chance of starting with snow and sleet, and ending with some ice. While we may be lucky to start with sleet or snow around the beltway, it's likely we turn to rain. Borderline temps will stay in the mid 30s. Still on that arctic blast for the weekend. As it arrives, this 'snow burst' on Saturday should be more impressive than what we just had. By Sunday, afternoon temperatures should range from upper teens in Carroll County and southern PA to mid 20s by the bay. The pattern is turning! We may have to shift our focus away from disappointing coastals, and wait for clippers. 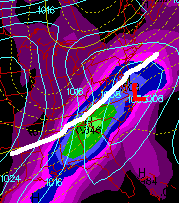 The long range for Thursday next week could look like the Dec 5th storm. I would be more than surprised if this worked out exactly as this view 9 days out- but the GFS model is still trying. We have the exact same toy and our son turns two on Saturday.